An angled tower wrapped in red concrete panels and glazing contains the entrance to this Second World War Museum which is mostly housed beneath the surface of a public plaza in the Polish city of Gdansk. The museum tells a complete story of WWII from start to end in chronological order and has the changing life of the citizens mixed in brilliantly. Real objects from the time, a wide range of multimedia and a huge amount of displays. The building is funky and it has a labyrinth of displays. The exhibits are not only related to Poland, but to all countries taking part in the conflict. There are also many reconstructions which make the museum more interesting. You can see how the streets looked like before the war and how it was destroyed afterward. The museum is also full of interactive resources. In many rooms, you can watch footages, interviews with people who survived the war or listen to the letter written by Polish soldiers to their families. 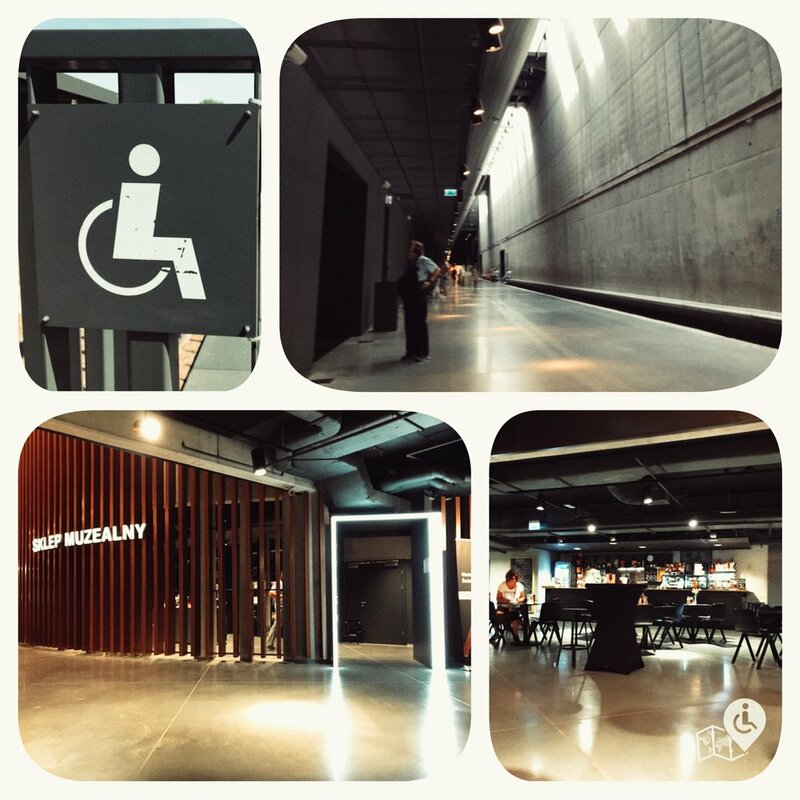 The whole place is very accessible for wheelchair user folks with elevators, ramps, wheelchair friendly toilets, cafe, bookshop and so on. The majority of the 23,000-square-metre building is located beneath the paved public square, which aims to provide people with a place to meet, socialise and relax. Elevators descend from the entrance through a large void to the level of the ticket office, cloakroom and exhibition spaces dedicated to telling the story of the war in Poland. World War II began with Germany’s attack on the Polish Military Transport Depot on the Westerplatte Peninsula in Gdansk (or the Free City of Danzig as it was in 1939) and so it’s appropriate that this remarkable museum, opened in March 2017, should have been built in the city. Nine years in the making, the whole experience is quite breath-taking and it really needs to be seen to be appreciated. The heart of the museum is the permanent exhibition which is split into three parts – The Road to War, The War’s Long Shadow and The Horrors of War. Within these three areas, there are a total of 18 rooms or thematic sections covering different aspects of how World War II came about and developed and the suffering it caused. Those interested in the topic can easily spend a whole day there, and even moving at a steady pace will need 2-3 hours just to see everything. Museum of the Second World War presents the catalogue of the permanent exhibition. The exhibition covers over 5.000 m² with around 2.000 exhibits shown on it. It is the result of many years of work that has been conducted by the team of historians from the Museum of the Second World War and its Advisory Board, which gathers eminent researchers from Poland and abroad.